It has been a long time my friends and I have missed sharing thoughts about art and new work with you. Now that Naomi is seven weeks old and I am starting to get the swing of this "motherhood" thing, I am hopeful that I will be able to stop by more often. 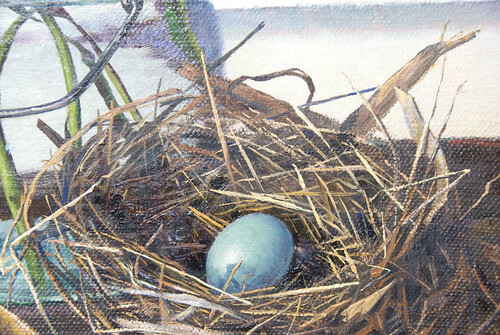 When setting up this composition I was enamored with the flowers, the bird's nest and the symbolic meaning of the robin's egg, and how I was holding onto my own little one while painting. I worked furiously to complete this painting before my little girl would arrive but fate dictated something different, and it turns out it also gave me the breathing time I needed to get away from this painting and to come back to it with new eyes. A few weeks after Naomi was born a good friend sent me a beautiful card with an image of one of Mary Cassatt's mother and baby pastels. I fell in love with this image and soon decided I wanted to incorporate it into the still life I had been working on, and so that is what happened. 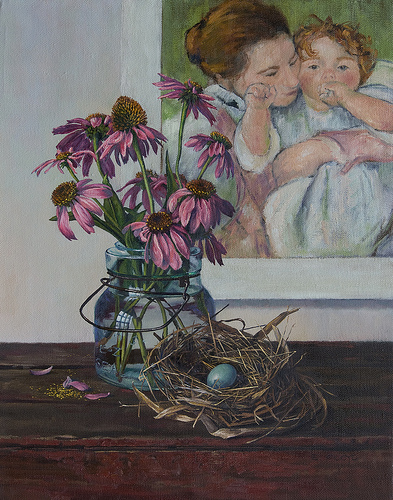 Over the past week I have been re-working the painting to include this image as if it were a poster I had pinned up on the wall behind the still life setup of the echinacea and the bird's nest. I still need to work on getting the flowers to pop more forward and to then go back into the bird's nest and repaint it where I took it out to change the background. Because of how this painting has progressed and evolved the tentative title is "Contemplating Motherhood". What do you think? Is this a good title or should it be simple like "Still life with Echinacea, Robin's Egg, and Print"? Please share with me what you think, I am waivering about what to name would work best. It is nice being back. So far I have been lucky in being able to grab a few hours here and there to paint. I am hopeful that as time goes by Naomi and I will get into a nice pattern of caring for her needs while also feeding my creative desire to get some time in the studio. Keep your fingers crossed that this is able to work out! 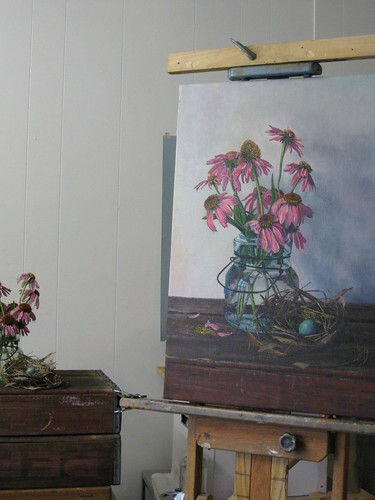 Here is the second still life I have been working on, it is of echinacea and a bird nest with a robin's egg. The echinacea are from my garden and they are the only flowers that are thriving in my neglected flower garden this year. With the pregnancy I have not been able to keep up with the weeds and mulching that is needed, so only hardy and established flowers are doing well this summer. The bird nest was given to me last autumn by my loving husband, he found it in the yard when he was raking leaves. I had been gathering bird nests with the idea of eventually incorporating them into some more still lifes, I had really enjoyed working on this painting with a bird nest last summer. The robin's egg came from a nest we had been watching for a bit this spring that a rascally fox attacked one night, I know it was a fox because the nest was in the hedge right outside my window and the night before the nest was destroyed that darn fox was making a racket under my window sill! We left the egg untouched for a week to see if the robin would come back and reclaim it but alas it was abandoned by the bird. 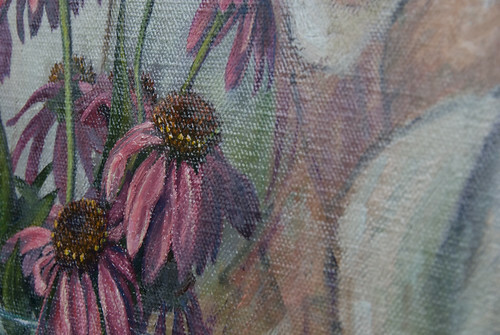 This painting is being completed on very rough linen, the texture is almost that of burlap, so it has been fun playing with this texture and learning how to adapt to this different surface after working on such a smooth texture with the sunflowers. 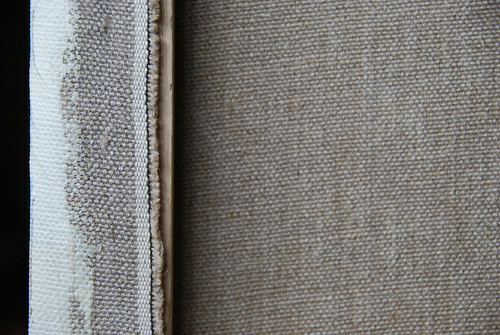 And as of this blog post I am going to be taking a bit of break from blogging. The pregnancy is coming to an end and I think it would be nice to reserve the option of check out for a bit. but then maybe not. So thank you for stopping by and visiting, I do so enjoy hearing from you. I am looking forward to the start of the adventure of being a mother to a little girl and know it will contribute lots of inspiration to future artistic endeavors.